Amidst complaints about less-than-desirable public-service delivery, the Government of Jamaica is pushing ahead to achieve world-class customer service through the more than 200 public-sector institutions islandwide. This is consistent with one of the Vision 2030 Jamaica – National Development Plan goals, which commits the Administration to “foster world-class customer service and professionalism in all public institutions and to create mechanisms for efficient and effective delivery of services”. Since April 2017, the Public Sector Transformation and Modernisation Division (PSTMD), which was created to streamline activities aimed at boosting government efficiency, has been engaging technocrats in the ministries, departments and agencies (MDAs), civil society and other groups at service excellence visioning workshops. These engagements form part of the Public Sector Modernisation Programme and are in line with the Administration’s undertaking to develop a Service Excellence Policy that outlines the core principles, values, standards, strategies and accountability mechanism that will promote and institutionalise service excellence to facilitate consistency in service quality. The purpose of the workshops, in which the wider public will also be engaged, is to establish a clear definition of service excellence and identify the underlying principles, values and standards that should drive the framework underpinning this across Government. Director General of the PSTMD, situated in the Office of the Cabinet, Veniece Pottinger-Scott, tells JIS News that the workshops are part of the wider transformation and modernisation agenda, aimed at establishing a culture of service excellence across the public sector, especially in the MDAs, which have a duty to provide services of the highest standard to internal and external clients. “It is an imperative. Without it, things are not going to improve at the rate anticipated in terms of growth and economic development over time. The public service workers’ image, for the most part, is nowhere near where we want it to be. It’s somewhat negative, and we think that it is very critical that that image be improved,” she says. The Director General says the objective is to create an overarching framework that sets out how customer service improvement should be undertaken in the public sector. ‘Part of what we are doing is to start the visioning process of what that ought to look like by way of shaping the elements that must comprise a Policy,” she informs. Mrs. Pottinger-Scott indicates that a survey of the status of customer service in the public sector was done to provide a baseline for future evaluation of the Policy and to establish the status of customer service across the public sector, and specific issues to be addressed. This survey was done by a consulting firm, Hurwich, and overseen by a steering committee comprising representatives nominated by Permanent Secretaries and Heads of Agencies. It also provided both quantitative and qualitative snapshots of service experience in seven high-impact areas of Government, namely health, business facilitation, revenue collection, security, justice, agriculture and social security. Some of the issues raised by clients included insufficient signage and poor accommodation at facilities, long waiting times and systems being too paper-based, limited facilities for the disabled, and lack of simple communication and transactional web services for customers. 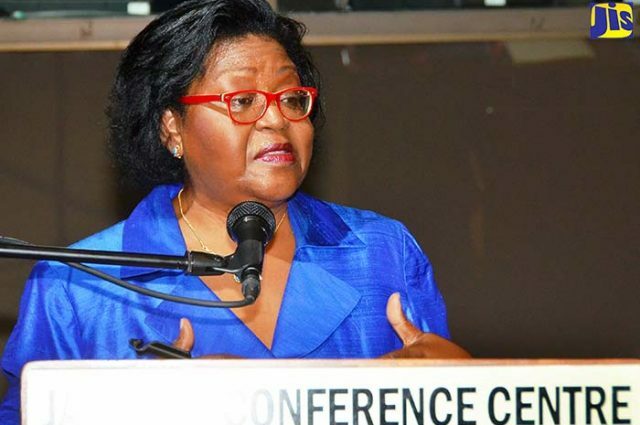 Mrs. Pottinger-Scott said public-sector workers interviewed during the assessment acknowledged the need for change in the culture of service and indicated their willingness to work to this end. The Cabinet Office will also be working with MDAs to improve weaknesses identified during the assessment. But this is not the only action being taken by the Administration. Over the past 20 years, successive Governments have implemented initiatives aimed at improving the quality of public-service delivery. One such is the biennial Public Sector Customer Service Competition introduced in 2001, which seeks to nurture and inspire a culture of service excellence by rewarding and recognising entities and individuals delivering world-class service. Over the years, a number of entities have gone the extra mile to improve the customer experience by reducing the waiting time to access services. Among these are the National Health Fund (NHF); National Housing Trust (NHT); Administrator General’s Department (AGD); Passport, Immigration and Citizenship Agency (PICA) and the Registrar General’s Department (RGD). Principal Director of the Modernisation Programme Implementation Unit, Wayne Robertson, acknowledges that services offered by some agencies are at a higher level than others, noting that some entities are using technology to facilitate the ease with which customers’ transactions are conducted. “But it needs to go wider than what we currently have. We need to get to a stage where all service providers are providing online solutions and are fully sensitising customers around various options,” he adds. Referring to some of the successes in the public sector, Mr. Robertson notes the introduction of a colour-coded ticketing system by staff at the Percy Junor Hospital, Spaldings, Manchester, which he says has alleviated some of the challenges encountered by clients. “We have seen improvements at PICA. There are (still) some challenges which they have, but we have seen improvements. If we do a trend analysis for the past 10 years, we (would) see (the) improvements there,” he further states. Mr. Robertson also lauds Tax Administration Jamaica’s (TAJ) introduction of online solutions for client convenience. He, however, emphasises the need for greater sensitisation of persons to get them to the point where they are in “e-base mode to automatically go to our laptops or desktop computers or cell phones when paying a tax, rather than go into the offices”. “We are seeing a heavy strain being placed on the internal machinery at some of these offices, because customers are not fully utilising the online option. So, we recognise there needs to be greater sensitisation on a more ongoing basis so that it resonates with customers that we need to use these options more frequently,” he adds. Despite these notable improvements, there are still lingering grey areas for some clients. Chairman of the Manchester Parish Development Committee, Anthony Freckleton, who attended a visioning workshop, says that body is working with the local municipal corporation to make Manchester “a parish of choice to live, work, raise families and do business”. He says one of the Committee’s first tasks is to focus on improving service delivery at health clinics, especially to the elderly. He further notes that the level of service in the public sector varies between urban and rural areas, adding that “some workers do not treat people as customers, since their life doesn’t depend on it”. Mr. Freckleton hopes that the new culture of service excellence being embarked on will permeate through every level of the public sector and be enforced by indexing it to workers’ evaluations., emphasising that “your salary increases must depend on or have some relationship with the level of service (provided)”. Another workshop participant, Jamaica Youth Advocacy Network, (JYAN) council member, Malike Kellier, tells JIS News that he wants to see a Policy “that is inclusive and not exclusive of any person, group or entity”. While acknowledging efforts being made to accommodate the disabled through the provision of signage and other services, he underscores the need for “some level of sensitivity and care” to be shown when dealing with the disabled on the streets. Mr. Kellier recounts an incident reported to him by a person with hearing impairment who claimed he was wrongfully ticketed by a police officer. He says the person tried to explain using sign language, but the police officer “got very flustered and issued him with a ticket (anyway)”. “I wouldn’t say that we are at our best or our lowest, but there is still a far way to go in improving how we provide services to various groups within our society,” Mr. Kellier contends. Contributed by the Jamaica Information Service.